The Arunachal Pradesh Youth Congress (APYC) held a rally here to protest against the Centre’s ban ( Beef ban ) on sale of cattle for slaughter at livestock markets. The rally started from Rajiv Gandhi Bhawan and culminated before reaching Mithun Gate which was stopped by magistrate and Police. 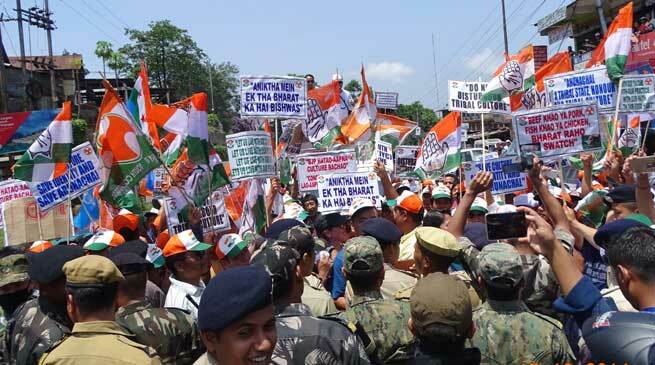 Slogans of “We will eat beef and it’s like vegetable to us” “ Kiren Rijuju hai hai”, “Pema Khandu hai hai” “KIshanno ke sammaan me yuva congress maidan main” were chanted during the rally which was attended more than thousand protesters mostly were from Arunachal Pradesh Youth Congress. The Congress also submitted a memorandum to state governor PB Acharya demanding lifting of the ban with immediate effect. “Neither Modi nor his government has the right to decide what we eat and cook in our households. This is not how democracy functions,” Indian Youth Congress Secretary in-charge for Northeast Sarifa Rehman said to mediapersons after they submitted a memorandum at Raj Bhawan this morning. “We have different cultures and traditional values in the Northeast and Arunachal in particular. Our food habits are different as we are scheduled tribes. Eating meat is associated with our culture. We cannot eat ghee (butter) and dal (pulses). So let us eat what we like,” APYC president Jikke Tako said. “Mithun, beef and pork, meat have a ceremonial place in the economic, social and cultural life of various indigenous tribes in the Northeast,” Tako said. Tribal’s have the habits of eating meat and no body can dictate us what we should not eat or what we need to eat, they should mind their own business rather disturbing the tribal people on the line of eating meat and beef Tako added.